By 1994, the idea that British indie guitar music was cresting became conventional wisdom, even if the eventual Britpop bands had little to do with the ones Select identified—along with Suede, the magazine singled out Pulp, plus three excellent artists who for a variety of reasons weren’t going to cross over and therefore failed to slot into Britpop’s boomtime narratives: The Auteurs (too misanthropic), Saint Etienne (too dance-oriented), and Denim (too biting and satirical). For the most part, the early wave of Britpop bands did sit nicely alongside the ones Select picked; they were groups enthralled with glam, post-punk, or other manifestations of the U.K.’s art-school musical history, yet were also easily packaged as product. As tended to happen with overseas trends in the pre-file-sharing days, by the time this bright new thing crossed over on its home turf and could be explained and sold to the U.S. media, most of the energy that made it exciting in the first place had waned. Britpop’s best records were sometimes not even released in the U.S., or issued months later with little fanfare or label backing. Logistics aside, the subject matter of Britpop was, often purposefully, coded with cultural references that made it difficult for American audiences to grasp. This was music that, at least in theory, celebrated what it meant to be young and British in the ’90s. Why? Blur was neither the first Britpop band (Suede) nor the biggest (Oasis); it wasn’t the most critically beloved (Pulp) and it wasn’t the one who best represented the giddy absurdity of it all at its peak (that’s the much-derided Menswe@r). But Damon Albarn’s group found lasting fame within these years, embraced the aesthetic of it wholly, and beat a path from indie outsiders to national treasure to borderline self-parody at roughly the same pace as Britpop itself. Blur started as a second-tier indie-dance band, producing a few hit singles, but didn’t start dabbling in national identity until 1993’s Modern Life Is Rubbish. Albarn and his bandmates began to adopt three-button suits and Fred Perry shirts, pushing against overcast grunge in much the same way the original Mods did against their dreary lives in England. The record itself is restless and varied, an underrated work from a group still locating an identity but using that anonymity as a strength. In singles “For Tomorrow” and “Popscene” the band would find its way forward. 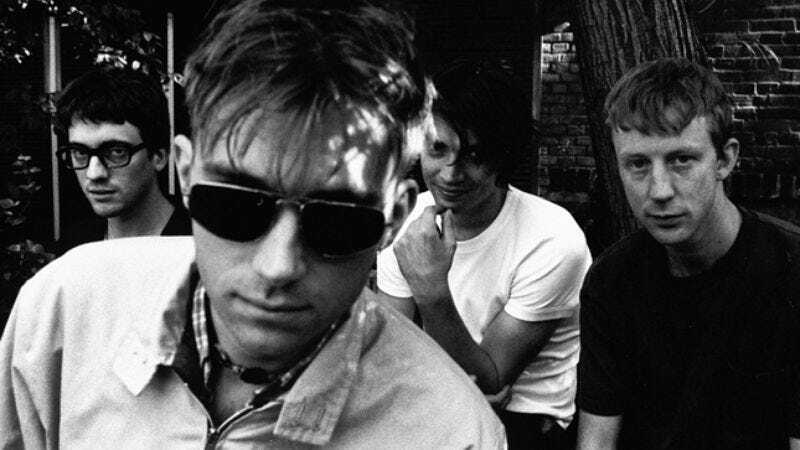 Blur located its sense of self on 1994’s Parklife. Hailed as a clarion call, the record is actually a pointed, even satirical, look at contemporary Britain. Yet once it took off, few seemed to notice. Songs lamenting the lost grandeur of the empire, character sketches of lonely fatalists, and complaints about traffic, boredom, disenchantment, and routine dot the lyric sheet, drowned out perhaps by the band’s dalliances in music hall, English brass, and dance-pop. In the end, perhaps Blur’s sunny disposition clouds a set of often tempestuous songs, and this sense of impending doom is the arguably the band’s most appropriately British quality. 1995’s The Great Escape ratcheted everything about Parklife up a notch, for good and bad. A clearly purpose-driven album, it lapses into by-the-numbers territory at times, but ballads “The Universal,” “He Thought of Cars,” “Fade Away,” and “Yuko And Hiro” maintain their grace and beauty, and even when the upbeat songs get hoary, guitarist Graham Coxon cuts an interesting figure amidst the murk. Next steps: Suede’s first two albums, 1993’s Suede and 1994’s Dog Man Star, encapsulated a lot of what had been missing in U.K. indie music during the grunge years, a time when sheets of noise and blissed-out guitars ruled the day and the groups who played this music (often very well) had such a dearth of charisma or stage presence they were tagged “shoegazers.” The members of Suede were thin, stylish, brash, and confident, with hooks as sharp as their cheekbones. Suede’s early run of glam singles—“The Drowners,” “Metal Mickey,” “Animal Nitrate,” “So Young”—characterized the band as hopeful romantics, while its more downcast B-sides (nicely gathered on Sci-Fi Lullabies) revealed it as doomed romantics. Another take on thrift-store glam was crafted by Pulp, which after more than a decade as a group finally hits its stride on 1993’s His ’N’ Hers. Singer and songwriter Jarvis Cocker shifted here into his suburban lothario persona, marrying low-rent disco to tales of sexual and personal politics. On the follow-up, 1995’s Different Class, he cast his eye away from his neighborhood and made perhaps the angriest and best Britpop record. Amidst all the backpatting of the era, Cocker’s turns on “Common People” and “I Spy,” in particular, are cutting and brutal but levied by a wicked sense of humor. The most well-known Britpop band, Oasis, was a refreshing antidote to the antiheroes of ’90s rock. The group’s old-fashioned rock bravado and swagger was on full display right from its debut single “Supersonic”; from there, Oasis practically willed itself into a stadium act. Specializing in songs that sound best when heard in a huge room amidst other drunk people, Oasis was the communal Britpop band. The group’s debut album, 1994’s Definitely Maybe, is still its best, a towering achievement in shamelessly performing to the rafters. There was almost a blunt logic to Noel Gallagher’s suspicion of art and his belief that if you’re going to play in a rock band, you might as well borrow from the best and aim to be the biggest band in the world. Elastica burnt out quickest among the Britpop bands, but in its prime it seemed like a test run for the Strokes, with fixations on Wire standing in for Television (and resulting in plagiarism lawsuits that were settled out of court). Regardless of where the source material came from, singles “Connection,” “Stutter,” and “Line Up” injected some bite and a lipstick-on-beer-bottle sense of style into the Britpop years, and in Justine Frischmann and Donna Matthews provided the era with much-needed female stars. Elastica’s self-titled album packed in a lifetime’s worth of no-nonsense, whip-smart two- and three-minute rock songs, which was just as well, as it’s the only music of consequence the band ever produced. The youthful exuberance of Britpop was best characterized by Supergrass, which volleyed both the brisk punk of “Caught By the Fuzz” and the brisk enthusiasm of “Alright” into the charts in 1995, along with three other singles from its debut album, I Should Coco. Steven Spielberg tried to cast them in a ’90s version of The Monkees; they turned him down and instead went on to make one more outstanding album, 1997’s In It For The Money, and a string of decent ones. And then there was Menswe@r. A group of scenesters essentially cobbled together like a Camden Town version of a boy band, its shameless chart-baiting endeared the group to virtually nobody, but singles like “I’ll Manage Somehow,” “Being Brave,” “Sleeping In,” and “Daydreamer”—the best Elastica song not written by Elastica… or Wire—hold up. For the real dregs, the sluggish, laddish Oasis acolytes that emerged from 1996 on were generally dreadful, with the exception of a stray song or two by Cast and Embrace. Otherwise, Ocean Colour Scene, Northern Uproar, and Kula Shaker are particularly terrible. Still, they’re more memorable than Britpop runts Longpigs, Shed Seven, Salad, Powder, Dodgy, Heavy Stereo, Marion, These Animal Men, on so on.